Gillian is 292 days old today and she loves to eat now. She’s eating mostly everything that I prepare for her. Apart from the baby cereals, I also cook milled rice and mix it with different vegetables. At times, I mix it with cooked squash or potato. Her favorite is when I blend it with beaten eggs. She also likes eating banana for dessert. 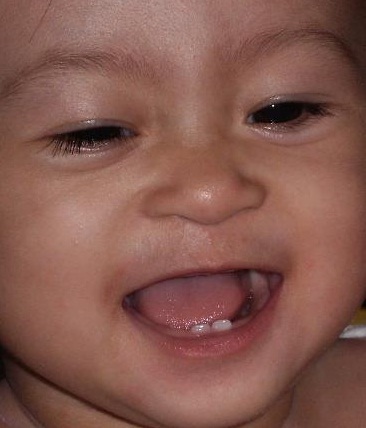 Yes, she’s doing pretty well in using her two teeth. She’s making baby talks and fond of yelling these days. I think Gillian has a soprano voice because when she yells, it is remarkably high-pitched. When I try to sleep in the morning, I can hear her shrill voice that only her knows what the words are meant. You know, it’s still hard to figure out all the words that she’s trying to make. Sometimes she may seem to say “De, de, de”, when she doesn’t want anything anymore. This may mean “hindi, dili, or no”. This often happens when you try to feed her with milk on a baby bottle, she would shake her head and say “de, de, de”. It is our cue that she doesn’t like it. Gillian prefers solid foods now than her milk. This is a good thing, I guess. It means that she’s growing. One thing that she likes doing nowadays is our book-reading sessions. When I read to her I must continuously say the words or else she would scream if we will stop it. She likes me to continue reading to her and not stop, not until she gets bored anyway. Honestly, we can finish four books in one reading session. Whew! I am constantly enjoying being a mom. Especially, being a mother of Gillian. Gillian and I are learning together each day. I – learning to be a more patient and responsible mom, and her – learning anything what she can and is able to grasp at her age. I know what is important to me now. I must remember not to settle this time. I may not have what I want but I KNOW now what it is and I will go for it. These past few weeks may be a blessing in disguise. Our company is restructuring and most of the employees are on floating status. We are sent on force leaves. I am one of the employees who are on temporary FL. This may seem unfortunate but I’m honestly glad that I had been able to view it as an opportunity to redefine my career. I have been planning to try working at home, primarily because I want to spend more time with my daughter; however, I was not able to pursue it due to my shifting work schedule. Most of the time, I work on night shifts and during my free time and rest days, I rather prefer to spend it with my daughter or sleep most of the day off. But these past few weeks, I have finally decided to go for it. I had been reading and researching about home-based jobs and luckily, I also have friends who already had started their career at home while raising their families. Since there was nothing much to do anymore, I went ahead and got an e-card from the bank which I can use in fund-transaction online. I also went to one of the local internet service providers (ISP) and signed up for a phone and DSL line bundle. Unfortunately, it got me a couple of weeks of visiting and prodding, for them to finally install the lines. My computer has an internet connection now and almost all is set to start this home-based job. My plan is to start as a part-time worker, if all goes well then I may have to quit my regular job. I’m crossing my fingers that it won’t take long for me to find jobs and get hired online. Afterall, I’m doing this not only because I want to have a better stress-free career but mostly because I want to be a full-time-hands-on mom.